A Washington Post photographer captured this private moment of Sgt Brian Scott paying respects to Spc Michael Gonzalez on Memorial Day of 2010. When this picture was placed in a Memorial Day article on the Washington Post website it became very public. The picture has circulated on Facebook post and placed in Meme’s, liked, loved, commented on and shared thousands of times. Good, bad or indifferent makes me smile to see it shared. Do people read his name on the headstone? If yes, do they Google to see who he was? Do they read the dates of birth and death? Do they understand that Operation Iraqi Freedom means he was KIA in Iraq? Do they know that BSM means Bronze Star Medal and PH means Purple Heart? Was it noticed that “In God We Trust” is the last line on his headstone? Why are the words “In God We Trust” the last line? 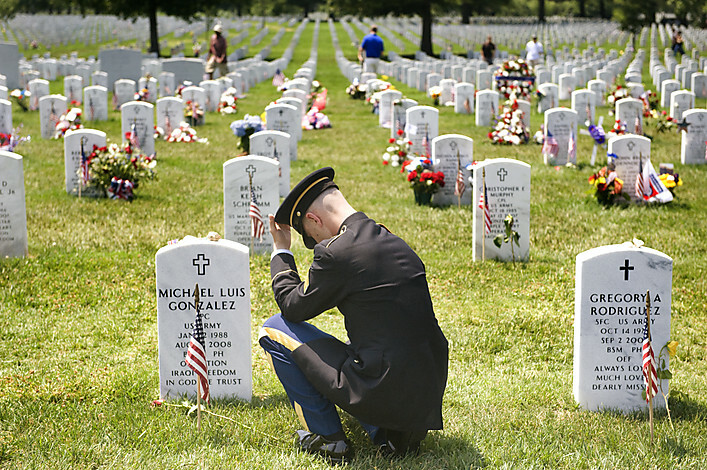 On September 10, 2008 is the day Michael was laid to rest in Arlington National Cemetery. Before the service at his gravesite we were sat down in a cubicle with a notebook of symbols and examples of what we could chose to put on Michael’s headstone. If you can imagine for one moment of the fog we as a family were in at that time. We chose the cross at the top and the rest was the same with BSM and PH spelled out with Purple Heart being the last line. About two weeks after the services in Arlington I had an overwhelming feeling that Michael’s headstone needed to say “In God We Trust”. Immediately I called Arlington to speak with to the head person to see if I could change the headstone. He said “Ma’am the headstone maybe done already. What did you want it to say?” I told him and he said he would do the best he can and he did. The word “endeavor” stuck out for me what does it mean “endeavor to be worthy” for me it is exactly what Butterfly Circle of Friends has been successful at accomplishing since the founding in October 2008. We strive to honor Michael’s memory by supporting others. Being part of making the difference in veterans, military and civilians’ lives.